The rear ends of the 4WDs all have their distinct personalities. Following the convoy as ‘Tail End Charlie’ allows a lot of time to become more familiar with this interesting facet of the vehicles. Take Sue and Richard’s red, 6 wheeler that is travelling smoothly ahead now. 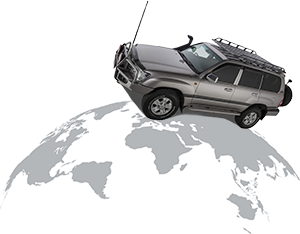 It is distinctive in that it is an 80 series which has been customised to a ute capable of carrying a slide on camper. From Tail Ends point of view, it has a truck like square form. Richard has put a serviceable ‘box’ with bat wing style access each side. Fantastic for this sort of trip. Better still if Robin heeds the 3 reminders so far to put the wing down before moving off. After a few false starts and bloke brainstorming their fuel pick up problem has been sorted. Robin and Clare have a one off for this 2017 trip. It is a Nissan in amongst all the Toyotas. The green Pathfinder is also the only petrol driven vehicle. 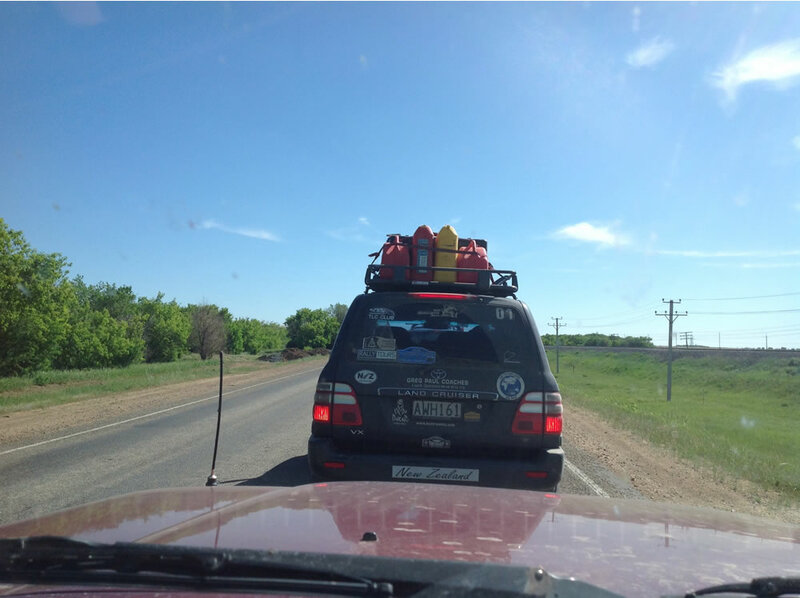 Two red fuel containers sit unmoving on his roof rack with his spare tyre. Tail End can distinguish it from a distance. From back here it is lower than all of the others however it hasn’t hindered them in any way at all so far. In fact, it navigated some serious ruts, rocks and mucky inclines on the 1,000 meter climb a few days back. It was a great advantage to have mud tyres unlike the Landcruiser and Surf that needed a winch by Greg Paul. Greg rated that track a 41/2 out of 5 difficulty day. 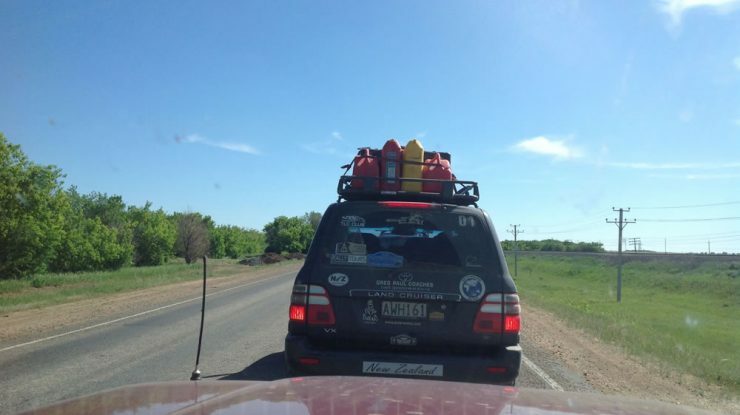 We observe Greg and Alli’s blue Surf’s, rear end more regularly than most. Taking advantage of the slightly slower pace near the back of the pack it can make for more photographic opportunities and time to smell the wildflowers. The only 200 series Landcruiser belongs to Mo and Trevor. Four, red fuel containers and two spare tyres sit atop this smart silver vehicle. An easy on the eye driving style makes following them a breeze. They didn’t need winching on that fun, optional afternoon. The following day though he had a blowout, possibly from something that damaged the inside wall of the rear right tyre. Brenda and Alan have a 100 series Landcruiser. Can’t comment too much at this point about their silver backside as it tends to be tucked in further toward the front. The soft, rear springs were replaced in Ulaanbaatar as they’d had been bounced around a bit too much. Val and Barry have a meticulously well prepared 80 series Landcruiser. Dark blue. They have had trouble with the left front shock absorber bushes. It has cut out 2 or 3. Some time ago with leader Greg’s encouragement, Barry broke from the bunch and entertained with a couple of tricky Mongolian river crossings. Vivien and David are driving an Overland Journey’s 100 series Landcruiser. It’s a yellow diesel canister that is the telltale identifier from behind. Their RT speak is also unmistakable as they are the only adventurers that haven’t come from NZ. The soft English accent makes a great balance as the sometimes serious, sometimes humourless banter flows up and down the convoy. Three flat tyres, two in one day for them. Brian and Enid are also driving one of Overland Journeys 100 Series Landcruisers. Another silver one which makes it a little harder to pick out. All’s fine and dandy with them. For many days the dust covering all their backsides and swirling like a sore eye, campfire smoke made it very hard to know who was who. But now we have come through the border into Kazakhstan. Quite a quick one for Greg with a 2-hour processing. The last of the team are waiting at the border booth to acquire their insurance papers. Then we will gladly tuck in behind once more for the final leg of our 550 ish kilometre day. There is a time change from 7.30pm to 6.30 pm.